If you like to buy, collect, and wear accessories, you must own the Precious Blue and silver Flower Earrings. The studs are made of Sapphires and Diamonds. A blue Sapphire of 6X4mm forms the center of the earring. Several round shaped Diamonds are placed around the Oval Sapphire. These gemstones are positioned and locked on a 10k White Gold Plate. The combination of blue and silver looks great with not only blue dresses but with most printed dresses. The diamonds weight a total of 0.24 CWT. The weight of the earring is not too much either. You can wear it for day-long events. You can wear it regularly too. If you take care of the accessory properly, it will last a lifetime. The design and color is so unique that it will always be in fashion. 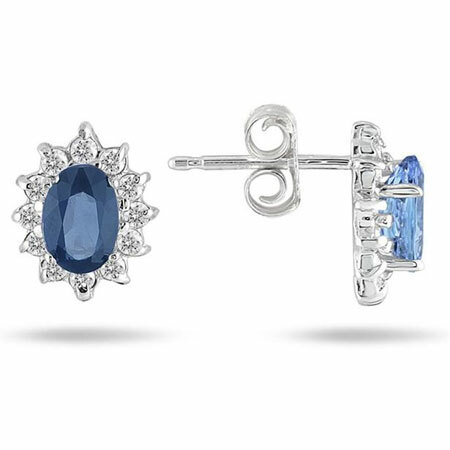 We guarantee our Precious Blue Sapphire and Diamond Flower Earrings to be high quality, authentic jewelry, as described above.